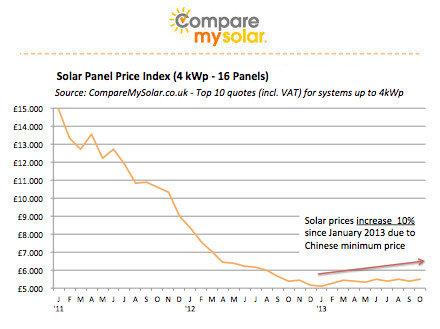 Solar panel prices have slightly increased during 2013 and are currently 10% higher than at the start of 2013. A 4kWp system (16 solar panels) that used to cost £5.000 is currently available from £5.500. On a South-facing roof in these panels will pay back about £850 per year, which is a return of 16%. 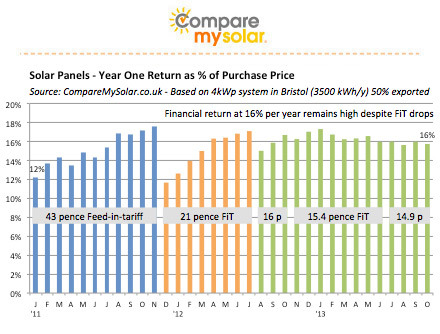 Despite price increases, solar panels still provide an great return due to a stable Feed-in-Tariff subsidy. 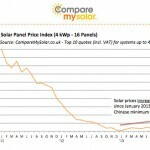 Our price index for solar panels (incl. VAT and installation) is currently 65% lower than early 2011, but has increased from earlier lows in 2013. Many installers are currently offering prices around £6.000 The lowest prices are around £5.500, and have increased due to the minimum prices of Chinese panels as set by the EU in August this year. Since these minimum prices are expected to remain in place till 2015, we expect little movement in solar panel pricing next year. On a South-facing roof in e.g. Birmingham a 4kWp system will produce around 3.500 kWh per year. This will provide a year one return of around £850 (based on 14.9 pence FiT and 50% of electricity exported), which is around 16% return on the best available solar panel prices (around £5.500), as shown in the second graph. The current financial return is still better than most months during the high (21p or 43p) Feed-in-Tariff rates due to the strong price drops of solar panels in 2011 and 2012. We expect the solar panel return to remain stable in the next year provided there are no significant FiT cuts.